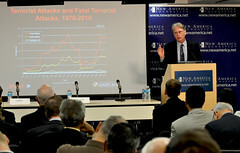 START data informs new Global Terrorism Index The number of terrorist incidents has increased virtually every year since 9/11, however, terrorism fatalities have fallen by 25 percent since 2007, according to the Global Terrorism Index (GTI), which is produced by the Institute for Economics & Peace (IEP) and based on data from the National Consortium for the Study of Terrorism and Responses to Terrorism (START), headquartered at the University of Maryland. 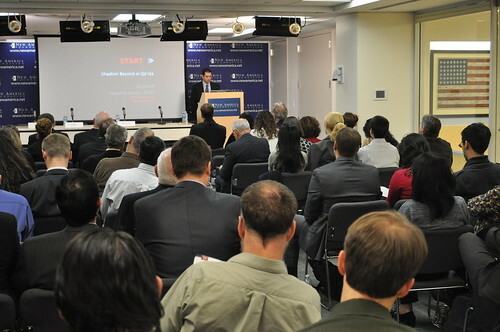 Released in the United States yesterday, the GTI synthesizes data from START's Global Terrorism Database (GTD) and then ranks countries on the impact of terrorism and analyzes the associated economic and social dimensions. In 2011, Iraq was the country most impacted from terrorism, followed by Pakistan and Afghanistan. The GTI illustrates how most terrorist attacks occur in a wider conflict situation. The index shows that global terrorism only started to increase after the escalation of the Iraq war. This was subsequently followed by further increasing waves of terrorism in Afghanistan and then in Pakistan eighteen months later. Often perceived as a major target for terrorist attacks, North America is the least likely region to suffer from terrorism, with a fatality rate 19 times lower than Western Europe, according to the GTD data. The United States has had the largest improvement in GTI score from 2002 ? 2011, dropping from 1st to 41st in the index, as the effects of 9/11 dissipated. Algeria and Colombia have also seen improvements in their GTI scores. "Terrorism is one of the most emotive subjects of our time," said Steve Killelea, Executive Chairman of IEP. "The impact of terrorism does seem to have plateaued over the last three years but is still unacceptably high. The aim of the GTI is to systematically analyze and quantify the phenomena." 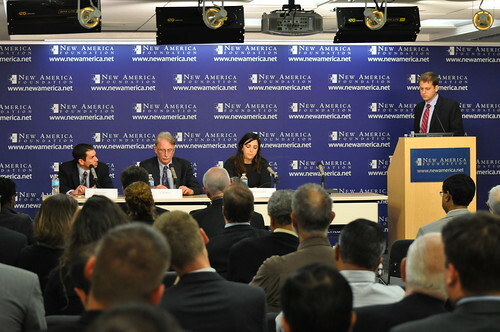 "Over the past 10 years, the worldwide nexus of terrorism has shifted from Western Europe and the Americas to South Asia, the Middle East and North Africa," said Gary LaFree, director of START and professor at the University of Maryland. 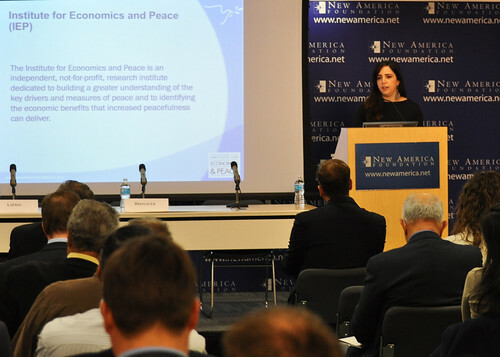 "One of the great ironies of our time is that while effective policy against terrorism depends especially on hard data and objective analysis, information on terrorism has been difficult to obtain. 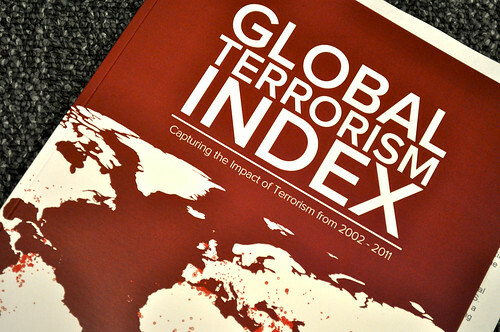 The production of the Global Terrorism Index goes a long way toward demystifying this destructive behavior and poses a challenge to policy makers around the world to provide effective counter measures." The first-of-its-kind index scores 158 countries over the last 10 years by aggregating a series of indicators. Based on START's GTD, these data include the number of terrorist incidents and fatalities, injuries and property damage associated with those incidents. The GTI analyzes many other factors and has found intergroup cohesion, human rights, group grievances, corruption and governance to be associated with terrorism. There were 7,473 fatalities in 2011, which is 25 percent less than in 2007. "The GTI highlights that many of the countries suffering the most from terrorism have also suffered from foreign military intervention," Killelea said. "Although the 'responsibility to protect' is paramount, caution needs to be taken against unwanted consequences. I urge policymakers to use the findings of this report to help redefine tackling terrorism strategies and help shift focus towards peace."